Some clients come to my hypnotherapy clinic in Leatherhead because they have repeatedly failed their driving test. Learning to drive is important in today’s society and many young people start to learn as soon as they reach the age of 17. Failing the driving test first time is acceptable. Many learner drivers almost see their first test as a practice. If they fail the second time then they become more anxious but continual fails cause anxiety and a change in their thinking. Each new test is viewed with dread and their thoughts become not whether they will pass this time or I can do this but instead they think ‘Please don’t let me fail again.’ Their belief system eventually becomes so overwhelmed with the thought that they can no longer visualise passing their test. Sometimes this leads to them giving up all together. When the client is older they find it even harder to pass their test and the statistics bear this out. One client I had here in Leatherhead was taking her test for the first time at age 45. She came to me saying ‘I can only do this once.’ Fortunately with a good driving instructor and hypnotherapy to reinforce her confidence she did pass first time. If a client has failed a number of tests then in hypnosis we rewind those negative events and put positive feelings in place. 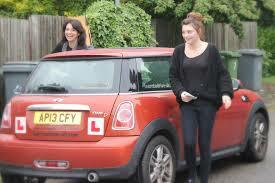 We also rehearse the driving test in hypnosis helping them to see and believe in positive outcomes. Helping the client to believe that they can pass their test is very successful and a number of clients have passed their test after 4 or 5 failures. Like many things in life, what we believe, we can achieve. It is many years since I took my driving test I still remember it as one of the most nerve-wracking things I have ever done. I also remember the feeling of elation I felt when I passed. Get in touch to find out how hypnotherapy can give you confidence for your test.